Designed for single users, small and large teams. 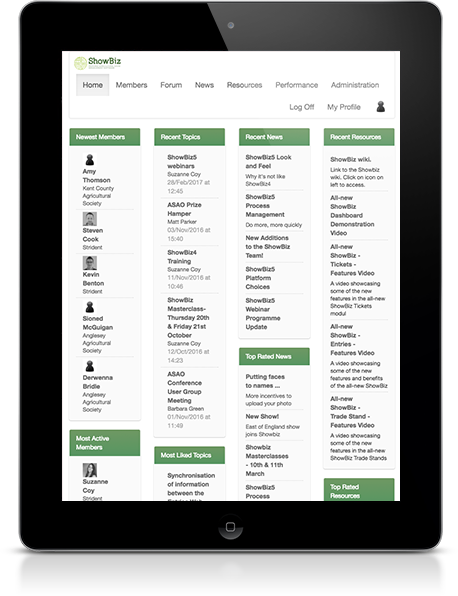 Manages all your show information in one well-organised system. Integrates with your web site to sell, manage and publish online. Works anywhere on any device for flexible working. Fully supported by an experienced, friendly team. Powerful yet simple to use, you can change to ShowBiz with minimum help or hassle. It’s easy to import your existing spreadsheets and show data to get off to a flying start. 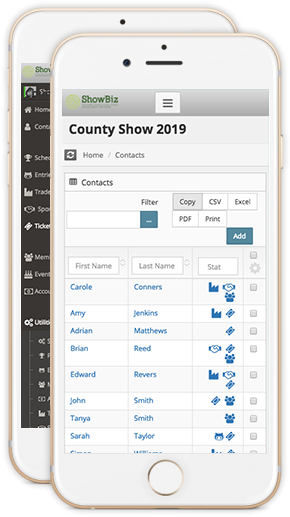 ShowBiz helps you manage all your exhibitors, visitors, standholders, members, sponsors, judges and stewards. Email or message them individually or in groups. Easily produce reports that keep you and your colleagues informed. It’s easy to book stands, sell tickets and publish results on your web site directly from ShowBiz. Reduce your administration and engage with your customers by working with them online. ShowBiz works anywhere and on any device. ShowBiz is backed up by a friendly, knowledgeable team with 20 years’ show management experience who’ll help you make the most of all its great features. Share and benefit from great ideas from other shows using our fantastic Talk ShowBiz community portal. ShowBiz incorporates more than twenty years’ experience into a responsive, consistent and clean design. Built on a powerful web-based platform, ShowBiz is faster and smarter than ever before. Get the latest ShowBiz information including product features and updates, customer stories and industry news.